But this arduous challenge continues. For most African livestock farmers, cheetahs are the last thing they want to see on their properties. In the 1980s, as many as 19 cheetahs per farmer died each year. Cheetahs were considered vermin—but, in learning more about this magnificent species, we know this is far from true. Today, CCF acts as a liaison between the farmers and the cheetahs, in order to promote cohabitation in an ecosystem that cannot thrive without the existence of the precious and predatory cheetah. On a wild ride through the African wilderness—sometimes sniffing out scents left in the dirt—Sy Montgomery and Nic Bishop join CCF in studying the cheetah’s ecological, genetic, and behavioral patterns in order to chase down the fastest animal on land and save the species—before it is too late. 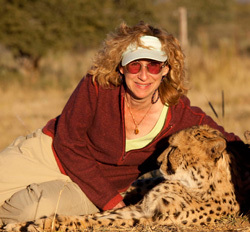 "Montgomery and Bishop draw readers into the setting from the very beginning with a map, description and photographs of the Namibian savanna where Laurie Marker founded the Cheetah Conservation Fund 20 years ago. There, in an area that is now part of a large nature conservancy, scientists and students take in rescued cheetah orphans, provide sanctuary, return most to the wild, and demonstrate ways farmers and cheetahs can live in harmony. Dogs and goats are key. " A tall, smiling woman dressed in black, silver bracelets jangling from one wrist and dark, curly hair flowing like a mane, is striding toward us—with a 90-pound, black and gold spotted cat at her side. Walking on a leash as calmly as a dog is a predator who can run as fast as a car races on a highway, a cat with the figure of a greyhound and huge golden eyes offset by long black lines curving down to the mouth. It's a full-grown cheetah —the fastest predatory animal on Earth and Africa's most endangered cat.